Opening Day is tomorrow, so it's time to predict what's in store for this season. I'll illustrate each division with a card that I got in my recent free haul from the team I expect to win. Sure, it's fashionable to rag on the Yankees because they have a few injuries, but Jeter, Teixeira and Granderson should all be back before the end of May. Obviously they can't afford many more injuries, but they still have a decent lineup and the best pitching staff, rotation and bullpen, in the division. I'd take the Yankees' starting lineup over one that features Yunel Escobar, James Loney, Jose Molina and Kelly Johnson, with no promise of mid-May reinforcements from the DL. This is going to be a really good team for the next few years, but will probably take a step back a bit this year, just because that's usually what happens to teams that have a sudden jump in the standings. The Blue Jays won 73 games last year - one fewer than the Mets. They pick up the 2nd, 3rd, and 4th best players from a 69-win Miami team, and suddenly they're favorites? I don't see it at all. It's very weird to pick them last, and I'm still kind of afraid of them, but it seems like they're just not the same without Terry Francona. This looks like a very solid team with few weaknesses. Robin Ventura will learn from some rookie manager mistakes. Hard to pick against this team in this division, but they could be in trouble if Miguel Cabrera goes Josh Hamilton on them. Nick Swisher and Jason Giambi will make this team fun, but they're probably a year or two away. A bold prediction - they will do better than Toronto. The Royals seem to be one of those teams whose prospects are always overhyped. It's time for their manager to go and probably their GM too. Too many big names in the lineup, and too much upside in the rotation, not to pick them. They were a fun surprise last year, but they're not going to sneak up on anyone anymore. Last season ended ugly, and that usually carries over. They seem to be returning to the Mariners teams of the 1970s and 1980s. The road from 107 losses to contention is pretty long. The Astros will probably be a little better, but not a lot. Atlanta and Washington look like they will be battling for the top of the division for a few years. Last year Washington edged out Atlanta; this year it will be the reverse. See Baltimore and Oakland comments. This team, with Harper and Strasburg, does have more upside than those two. They still have a great rotation, even if they're a bit long in the tooth. This year they should be more interested in developing their top young prospects rather than worrying about competing for a wild card. If Harvey, Wheeler, etc become as good as they hope, the Mets could be really good in another year or two. I guess they'll lose 100 games. They have a lot of good young talent and will bounce back this year. Like the NL East, there are two clearly dominant teams that will be neck-and-neck all year. Maybe this is the year they quit teasing and actually finish over .500? Norichika Aoki? Jean Segura? Marco Estrada? Wily Peralta? Who are these guys? With all the hype about the Astros, no-one noticed the Cubs lost over 100 games last year, too. Dynasty? They're best players are all still pretty young. They have a lot of good young talent, and this could be their year. I say that every year - at some point I'll be right. For a team with a payroll as high as the Yankees, they have a lineup with a lot of mediocre names - Luis Cruz is batting sixth on opening day. Their rotation could really be boom-or-bust depending on how Beckett and Greinke deal with some high expectations. This could be the type of good young team that surprises - the Padres do that sometimes. They haven't in a while, though. It would have been awesome if they named Jason Giambi as their manager. Taking Walt Weiss from a high school coaching job is pretty funny, though. I have one card of Junior Arias, from 2011 Topps Pro Debut. Playing career: Third baseman Junior Arias was signed by the Reds as an eighteen-year old in 2010, and played two seasons of Rookie ball before moving up to Class A in 2012. Where he is now: At Class A Dayton in 2012, he hit .208 with 7 HR, 35 RBI and 28 SB. Google Autocomplete results: He is second when you type Junior Ari, between Junior Arista, an NYC public school honor society, and Joeniar Arief Rapuh, a song. Another prominent Junior Arias is owner of P&E Construction in Florida. Coming up next: The next profile will be Tommy Arko. Tom Priddy is Digital Products Manager for the Spartanburg Herald-Journal in Spartanburg, S.C. and a veteran minor league baseball photographer whose images have appeared in newspapers, magazines, online and on baseball cards. Check out his website and blog. He kindly shared with me some baseball card stories. "My dad taught me about baseball when I was very young, and he took me to my first game in 1959 at Yankee Stadium. For years until I went to college we went to several games each year, at Yankee Stadium, the Polo Grounds and later Shea Stadium. I came along too late for Ebbets Field. I collected cards in the late '50s and early '60s, and still have many of the most valuable ones in a safe deposit box. Kind of defeats the purpose of having cards not to be able to look at them, but I feel better this way. 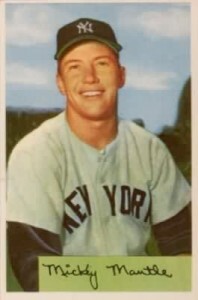 My best card is probably a '54 Bowman Mickey Mantle. I grew up seeing faces on the cards. This was, of course, back when very few of the cards were actual action photos. That was fine with me. I couldn't really tell what the players looked like on TV, so seeing their faces was a big plus. It made me feel closer to the game. Most were posed, tight images. Not too surprisingly, my favorite cards today are those that clearly show faces. Unlike those early card photos, almost none of my photos are posed. I think I may have asked a player to pose maybe twice, only on assignment. That's not my thing. It's a challenge to try to get a good, tight, head-and-shoulders candid shot, and I like a challenge. Although most cards today feature full-length action shots, my favorites are still the close-ups taken candidly before a game, mainly during warm-ups. Or tight shots of a player in action. My favorite time of day is the 20 minutes before a game, when players are warming up. So I planned to shoot him during long toss before a game. Of course, you also don't know for sure when a pitcher will be throwing, because they have very specific training schedules. But I was fortunate he was throwing the day I was there, and as a bonus he was wearing a game jersey. I was pretty lucky that day. The card turned out great. My favorite story about a card was with Kelly Johnson when he was with the Braves' organization. I was proud of the card the team made of him from my photo in 2003 or 2004. But the next year when he saw me again he needled me: "They have me bunting," on the card, he complained. Every player really wants a card showing him hitting a monster home run. Oh, well. I liked it, anyway. I like to say that every night when I was a kid I prayed to God bless mommy and daddy, and please put my picture on a baseball card someday. Well, I never made it to pro ball, but in a strange twist of fate a lot of my pictures are on cards these days. And as a photographer, I'll have a longer career than most players. I like the way things turned out." Thanks! 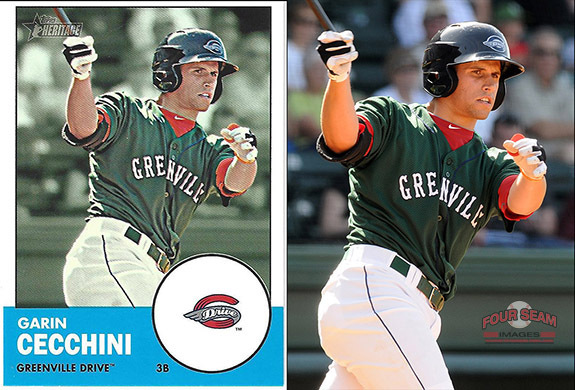 He also shared this cool image with a Topps card of Garin Cecchini next to the original picture. In addition, he took the photo for this Bowman card of Andrelton Simmons that I happen to have in my collection. I have one card of Nolan Arenado, from 2011 Topps Pro Debut. Playing career: Third baseman Nolan Arenado was the Rockies second round draft choice in 2009, and was named the 42nd best prospect in baseball by Baseball America after hitting .298 with 20 HR and 122 RBI for Class-A Modesto in 2011. Where he is now: At AA Tulsa in 2012, he hit .285 with 12 HR and 56 RBI. It appears he will start 2013 in AAA. Google Autocomplete results: He is second when you type Nolan A, between Nolan Aibel and Nolan Aibel Hockey, referring to a hockey player at Yale. There do not appear to be any other prominent Nolan Arenados. Coming up next: The next profile will be Junior Arias. I answered a Craigslist post and ended up getting several thousand free cards from a guy in Brooklyn. There was too much for me to carry on the subway, so he was kind enough to let me go through boxes of cards in the foyer of his brownstone for half an hour. He still has about 10,000 cards left to give away - mostly "junk wax" (some of which were possibly complete sets of 86 Topps, 87 Topps, 88 Donruss, definitely complete 89, 90 and 91 Topps Traded) but there was a lot of vintage baseball and football which I don't touch because every collection has got to have some limits. I even saw stuff like '75 Topps Mini and '77 Topps Cloth. His apartment is a block away from the R train so easy to get to for a New Yorker (like Night Owl, for example). If you want to get the rest of the cards, here's the link to his Craigslist post - tell him Bo sent you! A ton of 1992 Leaf, both regular and Black Gold. There will be a lot to trade from both, like this Black Gold Rickey, of which there were at least two. A ton of 1993 Leaf. Again, will be tons to trade if anyone is interested. There were two complete 1992 Score Procter & Gamble sets. I'm keeping one - one is up for trade. Eighteen cards, still in their wrapper. A complete 1988 CMC AAA All Star set. I didn't have any of these cards, and it's a great set with lots of big names like Randy Johnson and Gary Sheffield. 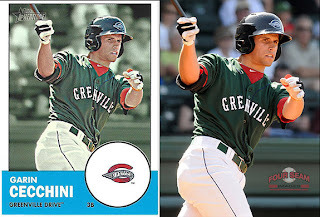 The DH was Lonnie Smith who had ten years of minor league experience at that point. A complete Ames 20/20 Club set. Ames was once one of the largest discount retailers in the US. There is a website called Ames Fan Club with interesting forums about Ames and other defunct retailers, and the traces you can find of them today. Interesting stuff. Lots of 1993 Donruss Triple Play, including this classic. Cowboy Nolan Ryan. I actually contemplated getting a similar card at the flea market over the weekend, but decided against it. (Slim pickings at the flea market dime boxes lately.) I'm glad I did as I now got this one free! Lots of minor league cards, including a near-complete set of '91 Line Drive AA. Will have some cards to trade from this set for sure. Tons of 1992 Stadium Club, including this beauty. Will have lots to trade here. There were probably about a thousand 1992 Ultra cards. I already had most of the set so there will be a LOT to trade from this set. Check out my latest article at the Hall of Very Good - Top Ten Terrible Airbrush Jobs. I have two cards of Chris Archer. This one is from2011 Bowman Chrome Prospects. Playing career: Chris Archer made his major league debut with the Rays in 2012, going 1-3 with a 4.60 ERA in six games. 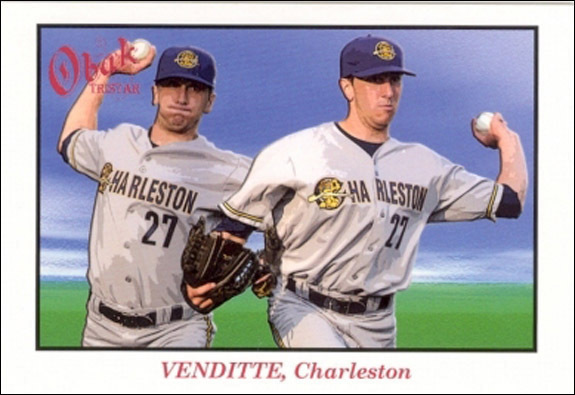 Where he is now: He will start 2013 in AAA but will probably make the major league rotation at some point this year. Google Autocomplete results: He is second when you type Chris Ar, between Chris Arnade, a photographer, and Chris Armstrong, former President of the University of Michigan Student Assembly who was harassed online by an Assistant Attorney General in Michigan. Another prominent Chris Archer is an attorney in St. Louis. Coming up next: The next profile will be Nolan Arenado. I have one card of Andy Araujo, from 1989 ProCards. Playing career: Andy Araujo pitched nine seasons in the Red Sox organization, going 50-68 with a 3.69 ERA. Where he is now: Anyone know where Andy Araujo is now? Google Autocomplete results: He is ninth when you type Andy Ara, between Andy Araya, Director at hawkBIT Technology, and Andy Aranyi, an advertising executive. Another prominent Andy Araujo is Account Executive at KCI. Coming up next: The next profile will be Chris Archer. I have one card of Rick Anton, from 2011 Bowman Draft Picks & Prospects. Playing career: Rick Anton was the Dodgers 11th round draft pick in 2011, and pitched in fourteen games at Ogden and Great Lakes, going 1-1 with a 3.07 ERA. Google Autocomplete results: He is ninth when you type Rick Ant, between Rick Santelli, an anchor on CNBC, and Rick Antle Yale, an accounting professor. Another prominent Rick Anton is an insurance agent. Coming up next: The next profile will be Andy Araujo. I have one card of Jeff Andra, from 2001 Bowman. Playing career: Jeff Andra pitched five seasons in the Giants organization, going 26-30 with a 4.56 ERA. Where he is now: A financial advisor at Edward Jones and a baseball instructor at 68’s Inside Sports in Kansas City. My memories: He recently shared some baseball card stories with this blog. Google Autocomplete results: He is third when you type Jeff Andra, between Jeff Andrade Duncan and Jeff Andrade Ted Talk, both of which refer to an education expert. My father-in-law was taking my daughter for a walk yesterday and noticed that his neighbors had put some trash out onto the curb, and among the trash was a binder full of cards! Someone was just going to throw out a few hundred cards (about 50% baseball, 50% other sports). Luckily, my father-in-law rescued it an the cards are now mine! Fortunately the cards were all in plastic sheets as it snowed yesterday. As it is the cards that were in the top of the binder were exposed to the snow and got wet. Fortunately I don't care about condition. Thanks to the water damage you got some pretty damaged cards. 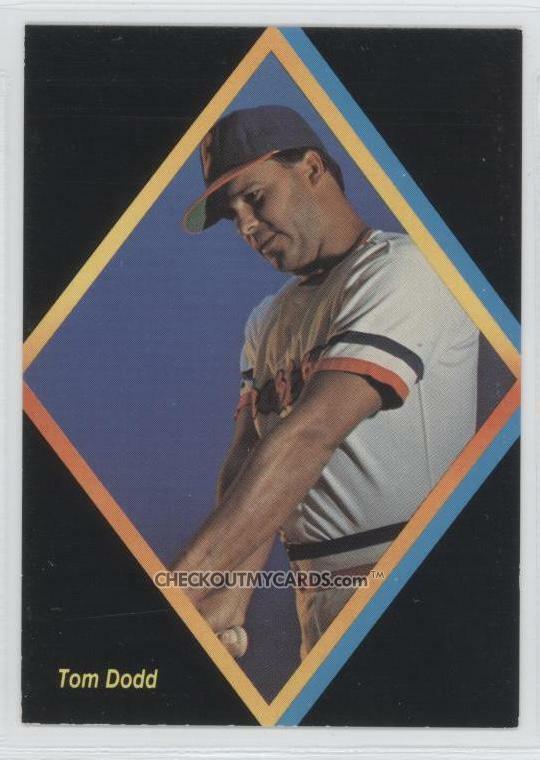 One of the funniest is this 1993 UD Steve Sax card, which split cleanly down the middle. There were a lot of great cards, including a bunch of foil star cards from MLB Showdown. The most interesting cards in the set might actually be basketball, not baseball. I wouldn't even have noticed these (I don't collect basketball) except they were in plastic sleeves within the pages that noted they were rookie cards. These were in the middle of the binder in double plastic so they are in good shape (not mint but basically OK) if anyone wants to trade some baseball cards for a Kobe Bryant or Tim Duncan rookie card. (The orange stickers are on the plastic sleeves, not the cards). My mailbox got PWE-bombed by Jaybarkerfan this week. Some people may complain about being PWE-bombed but I never will. This is the second nice thing he's sent me in a week. I dropped a PWExplosive for him in the mailbox this week, so he should get bombed with some vintage soon (if the Department of Homeland Security doesn't intercept if first!). Three cards from 2008 Topps Updates Highlights. Two guys I completely forget were ever Yankees, and a third who I wish never was. That's a strange grimace on A-Rod's face. May 30, 1942. In the first game of a doubleheader, the Yankees knocked off Washington 5-1. Joltin' Joe was 0-4 with an RBI. He went 1-3 with another RBI in the second game as the Yankees pulled off the sweep. The middle infielders were the big stars - Phil Rizzuto had five hits in the doubleheader, and Frankie Crossetti had four. Two older cards that are up for trade as I already had them - a 1982 Kmart Thurman Munson card - a rare bearded Yankee - and the 1981 team picture card. Joe Fontenot pitched five seasons in the Giants and Marlins organizations, reaching the major leagues in 1998 with Florida. Now a full-time baseball instructor at Ninth Inning Baseball in Chamblee, GA, he kindly answered my questions about baseball cards. "I did see the blog and Russ Ortiz’s comments on the weather conditions our first year in Bellingham, Washington. I wasn’t there yet when they took those team photos for the cards, but I sure heard about how cold it was. They later took a quick shot of me in warmer weather throwing some side work and added me to the team card collection. I’m pretty sure I have a couple of favorite cards of myself. I do enjoy the Bowman collection with New Orleans in the background. I always liked that one. I had never collected a baseball card in my life until I received my teammates' cards and cards of myself. Obviously that is the extent of my collection and I will always cherish those memories and teammates." Thanks! Here is a card of him from my collection when he was with the San Jose Giants. Outfielder Tom Dodd played eleven years of professional baseball, mostly in the Yankees and Orioles organizations. 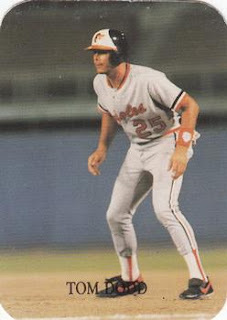 He made the major leagues with the Orioles in 1986, hitting .231 with 1 HR and 2 RBI in eight games. Now Vice President, Southern Sales Region at Kaplan Early Learning Company, he kindly answered my questions about baseball cards. "My favorite card set comes from the 1987 Charlotte O’s. We had just come off a long bus ride from Orlando and they had set up the photo shoot for when we got off the bus. Bad idea. Most of the players goofed off for their picture including me in which I was holding the bat cross handed. We took an impossible situation and ended up with a pretty good set. My favorite personal card is my only MLB card. Do you remember the 1987 Rookies set by Rob Broder? If not, look it up. This guy was putting out unauthorized cards and MLB put him out of business. Anyway, I was on first base only 3 times in my MLB career and he got one of them." Thanks! I had not heard of Rob Broder, and was interested to look him up. It turns out not much is known about him today, or if that was even his real name. 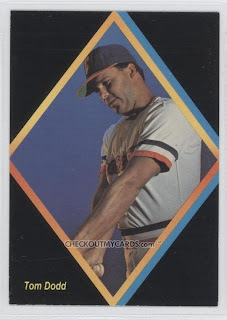 The 1987 Rookies set was an unlicensed set advertising a sports photographer named Rob Broder. This set was so popular that over the next few years, many similar-looking unlicensed sets were produced, often called "Broders" though it is unclear whether Broder was actually involved in any of the subsequent sets. DaClyde of Clyde's Stale Cards has put together a great Broder/Unlicensed Reference Guide complete with checklists. I don't have either of the cards above, but here is a card of Dodd I have with Charlotte from a more sedate photo shoot. Jaybarkerfan's Junk is often giving away cool cards. Usually, I don't go after autographed cards, but I wanted Matt Luke's Old Judge card because he mentioned it in the interview I did with him a few years ago, when he wrote, "On my Old Judge card my head was photo imposed on to my body-pretty weird." Now, thanks to JBFJ, I have this card, which I never really expected to get. Thanks! 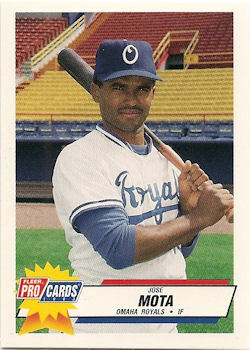 Infielder Jose Mota played twelve seasons of professional baseball, reaching the major leagues with the Padres and Royals. He is the son of former big leaguer Manny Mota, and the brother of former pro ballplayer Gary Mota, who I interviewed for this blog last year. He is now a broadcaster for the Angels and is co-Founder of Mota's Faces, which promotes the involvement of American youngsters in assisting impoverished school children and their families in the Dominican Republic. "The card in Omaha for the 1993 season is the last time I didn't have a mustache. 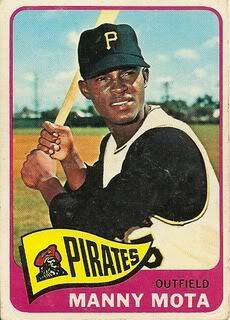 In my broadcast bag I always carry a 1960's card of my dad with the Pirates uniform. I don't collect cards anymore but, as a youngster, absolutely. We found a way of buying entire cases back in the early 80's and I enjoyed all of that bubble gum." Thanks! Here is a card of him from my collection, from Topps Debut. 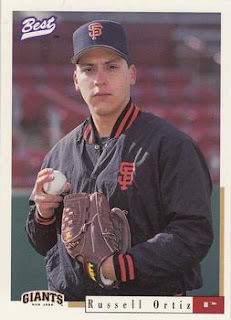 Russ Ortiz pitched twelve seasons in the major leagues, mostly for the Giants and the Braves, going 113-89 with 1,192 strikeouts. His best season was 2003 with the Braves, when he went 21-7 and finished fourth in the Cy Young voting. Now the owner of 2nd Guy Golf, a golf gear company that donates a quarter of its proceeds to the Phoenix Children's Hospital, he kindly answered my questions about baseball cards. "There is one card that has my name and stats, etc but the picture is not me. It's of a former teammate Rich Rodriguez. He's a lefthander. The very first baseball card pic I took, it was FREEZING cold. I had to borrow a hat. My face is red from the coldness. I do not collect baseball cards. I did for a bit but then they all got stolen." Thanks! I don't have either of those cards, but here is one from my collection. I have one card of Tyler Anderson, from 2011 Bowman Draft Picks and Prospects. Playing career: The Rockies' number one draft choice in 2011, Tyler Anderson had a great pro debut in 2012, going 12-3 with a 2.47 ERA at Asheville. Where he is now: He will be moving up the Rockies' system in 2013. Google Autocomplete results: He is ninth when you type Tyler An, between Tyler and Catelynn Teen Mom and Tyler and Catelynn Break Up, which refer to the MTV reality show. The first result when you Google Tyler Anderson is not the ballplayer but someone who recently died in a car crash in Maryland. Coming up next: The next profile will be Jeff Andra. I have one card of Tim Anderson, from 1987 ProCards. Playing career: Infielder Tim Anderson played two seasons in the Dodgers organization in 1986 and 1987, hitting .246 with 0 HR, 28 RBI and 19 SB. Where he is now: Anyone know where Tim Anderson is now? Google Autocomplete results: He is first when you type Tim Ande, before Tim Anderson Bernstein, referring to a Senior Analyst at Sanford Bernstein. There are no references to the baseball player on the first page of Google results; the first is for a football player. Coming up next: The next profile will be Tyler Anderson.